These are the most elegant Palki Sahibs carved out in brass with the most exquisite looks. While the wooden base gives the Palki Sahib a firm foundation the Brass covering provides it a sparkling sheen and a look of royalty. What makes it really special is that the brass carving is all done by hand with the help of special tools by very skilled craftsmen. Its has a brass topping covering the wooden roof, the side pillars are of pure brass (no wood undernath) and so are the base pillars. These pillars go a long way in complementing its metallic look. The base where Sri Guru Granth Sahib Ji is to be seated is made of wood (to render strength) while the walls of base are covered with Brass Sheets. Perfect for your Home Gurdwara or the Community Gurdwara. We supply it in four standard sizes so that you can choose the one that fits your needs according to the kind of space you have at your disposal in Baba Ji's Room or the Gurdwara. Brass Palki Sahib is the one generally selected by most people for its great look. The speciality of these Palki Sahibs is that they can be easily box packed for easy transportation to any part of the globe and then set up again in less than 5 minutes as we make them foldable to 1/3rd their size. Please note that if you are outside India the Palki Sahibs are sent through air Courier to you which delivers in 7-15 days depending on your country. 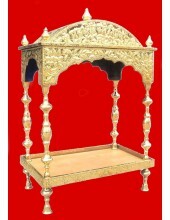 Besides we need only 0 -10 days of manufacturing time depending on which Palki Sahib you choose and our order queue. 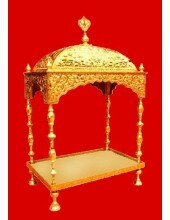 So after you place your order you get the Palki Sahib delivered to you in 7 - 25 days. If you have any questions regarding the Palki Sahib you can have them answered by writing to us at contact@jsks.biz.